At 4,080 miles long, the Amazon is the largest river system in the world with a drainage area of over two and a half million square miles. More than 1,000 tributaries lead into the Amazon and 25% of the world’s freshwater emanates from there. 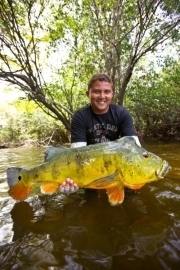 The Amazon also has the best peacock bass fishing in the world.